The contoured fit of the thumb and fingers provides comfort and a reduction in hand fatigue, especially in long procedures. 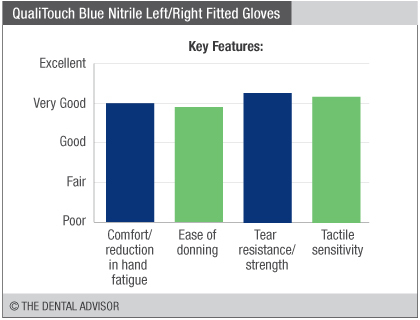 The nature of the thermo-responsive nitrile used to make QualiTouch Blue Nitrile Fitted Gloves is that they feel snug at first, then adapt to the hand as they warm to body temperature. The gloves provide a level of comfort closer to latex. 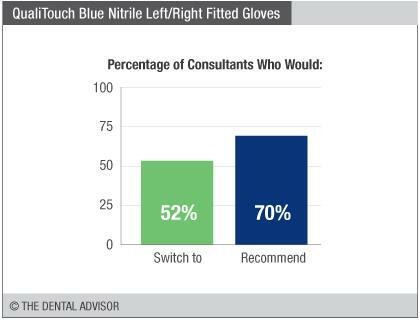 QualiTouch Left/Right Fitted Gloves were evaluated by 23 consultants in 2000 uses. These fitted gloves are ideal when performing long procedures since they allow the hands to maintain a relaxed position. Textured fingertips provide good grip and tactile sensitivity. The light blue color is easy on the eyes. Use the Glove Sizing Guide, printable from the company’s website, to select the proper size. 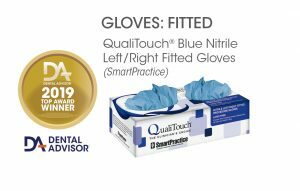 QualiTouch Blue Nitrile Left/Right Fitted Gloves are exam gloves with a surgical fit. The gloves are powder free and are manufactured on an anatomical form with curved fingers and textured fingertips. QualiTouch Blue Nitrile Fitted Gloves are available in 5 sizes: 6.5, 7, 7.5, 8, and 8.5.